Have a nice summer – time for parental leave! It’s that time of the year again. Time for me to take a break from blogging, and computers in general, to instead spend some months together with my family. I’m currently on parental leave, and will start my new job at Valtech September 1st. 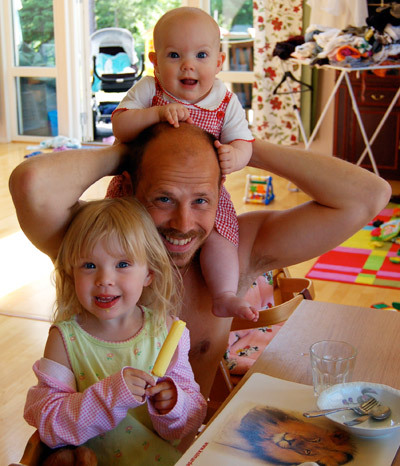 As opposed to last year, when only I and my eldest daughter Emilia were having the whole summer together, this time the entire family is together; that means me, Fredrika and our two wonderful daughters Emilia and Filippa. Cool. So this means that you will have no alone-time whatsoever? This means that I, most likely, won’t be writing any posts here, replying to comments or e-mails. You’re naturally free to comment, I love getting them, but please just don’t expect any reply. Well, if you really like my writings, I advise you to make a visit to the archives page. It contains every post I’ve ever written here, since March 3rd 2005, and they’re listed in date order with the name of each post printed out. Other blogs and web sites well worth reading are the ones mentioned in 5 blogs that make me think, Emil, Snook and generally just the ones in my blogroll. Additionally, if you like looking at pictures, I’d like to recommend my Flickr photos page, and especially the ones from our Round the world-trip. To be honest, I’ve grown quite fond of you, dear readers. Not getting comments and having discussions for some time will be hard on me. I appreciate you reading, giving me feedback and generally just being there so much! From the bottom of my heart, thank you! You might remember that I reinstated the ads in this web site about a month ago, and since then I’ve made roughly $120, which will all go to charity. My idea is to give $100-chunks to each cause every time I reach that amount, and first out will be the Swedish branch of the Save the Children organization. Thanks everyone for clicking the ads, and hopefully actually reading their message as well. If you were to use the button on you mouse occasionally in the future too, I and a lot of charities, and subsequently people in need, will sincerely appreciate it! What a great picture of you and your girls. I can't believe how much Filippa has grown, it just seems like yesterday I read your post about her birth! You have beautiful girls (including your wife)… I'd wanna stay home too! So with that.. have a great summer, you'll be missed immensely.. and stay safe! Oh ya.. don't forget to help your wife a bit hey. I bet she needs a much needed break too – "Summer break.. what's that?!" Must be nice to take months off at a time. 😉 All the best and enjoy your time with family. You might need a vacation from them by the time the summer is over. ha! Thats great that you can spend some time free with the family..
A small word of warning about the ads. I've read that referring to them and telling people to click them is against the terms of service, so be careful about that. Wow, you will now have 2 months to relax and, well, basically, do nothing 🙂 . Enjoy every minute of it. Enjoy your summer off! Looking forward to your return in September, and news of how your summer went. Wow! You Swedes get all the benefits. Robert gets two long breaks from work in quick succession and apparently, if you suffer from heavy metal addition in Sweden, you can get disability benefits. Have a nice one, I have a week left then I'm off for five weeks! Maybe I'll show up in Sollentuna….beware!! Sweden shuts down for five weeks; so I am lead to believe around now? I try to stay away from computers in the evenings too; at least that is as long as the rest of the family is awake. And absolutely, I can't stress the fact enough to get a balance between computer time and a "normal" life. Thanks, and thanks you for the heads up. I hope they will overlook this since it's for a good cause. Thanks, keep up the writing, ok? Man, I gotta get diagnosed with that too! And thanks for the heads up on the typo. Yes, It's one of the tunas… 🙂 Vallentuna is actually correct. A great summer to you too! Thank you! And yes, at lest during July, the corporate world is pretty much non-existent. It's a remnant from the old industrial vacation schedules in Sweden. I really should talk to or meet Tommy, I know. It's been a while now. Ah, welcome! If the weather's good, it's a fantastic place! Good luck with your job at Valtech. They're a cool company! If you ever run into anyone who's worked with SonyEricsson at Valtech say hello from Sandy (ex-MediaCatalyst). Have a great time – best regards from Berlin! Enjoy your parental Leave Robert, unfortuntely I only found this blog a few days ago so will have to wait for some fresh posts. Either way have a great time and I"m sure your archives will keep me busy! haha great man, have fun and see you back soon.